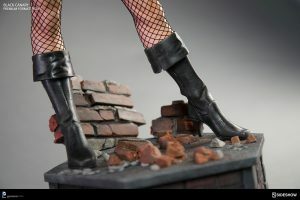 Sideshow Collectibles has revealed their coming Black Canary Premium Format Figure and I will now give my initial thoughts on this piece based on the material currently available. This should not be considered a review, but rather as my first impression of the piece. 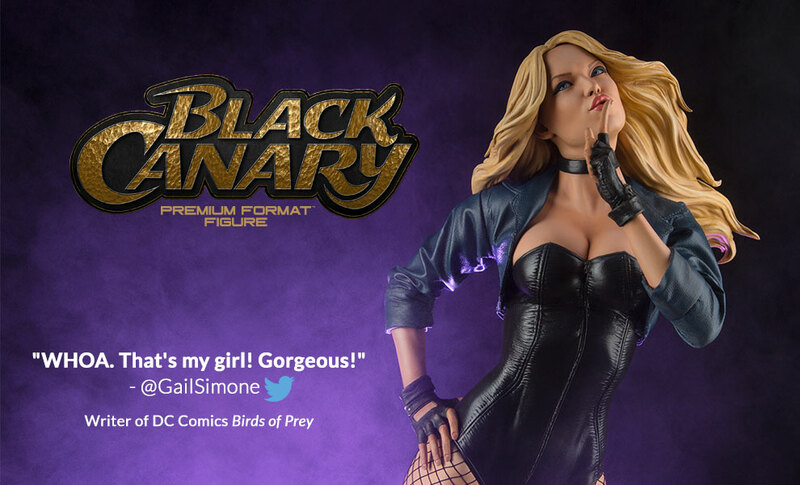 Black Canary coming to the Premium Format line of collectibles from Sideshow Collectibles. This is quite surprising, I must say. Once again, this “Batverse” Premium Format is inspired by the magnificent artwork of Stanley “Artgerm” Lau – it really seems like Sideshow is embracing the vision and inspiration of Lau, and it’s really putting die-hard fans and collectors in a sweet-spot. Now, I haven’t been able to source out an actual piece of pre-existing artwork, so my conclusion is that Lau worked closely together with the Sideshow Design and Development Team to create this unique rendition of Black Canary, which only makes it all the more awesome, really. To be more specific, this statue was designed by Ian MacDonald, Stanley Lau (as mentioned), Kris Anka and Zac Roane. 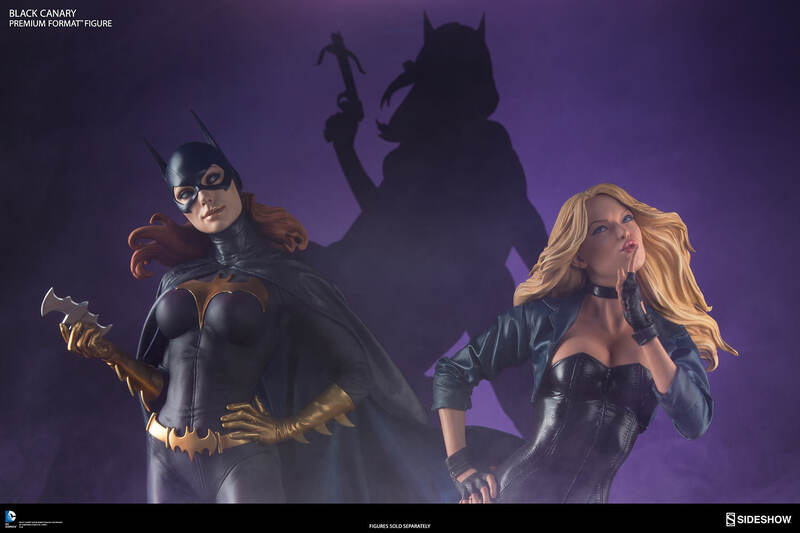 The announcement and reveal of this statue came at the same time (almost) to that of Huntress, and this suggests that Sideshow has plans of realizing the superhero team Birds of Prey. 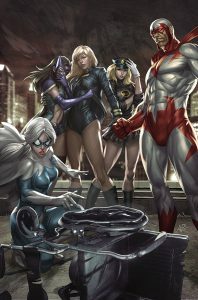 At least, hopefully, we’ll eventually see all the core members of this unusual superhero team. So let’s have a look at what we’ve got here. It’s not unusual that the art that Stanley Lau creates or is involved in sports an almost pin-up styled design. This is in terms of the expression and attitude of the statue, combined with the pose. We’ve seen that on earlier Premium Formats from the same line, such as Poison Ivy, Power Girl etc. First and foremost, this statue possesses a very beautiful sculpt. Obviously, there are some quite evident tones of sexuality going on here, which is also very fitting to a pin-up styled statue. The body, the legs, and just the overall anatomy of the statue is extremely well made. She looks very realistic, but in an idealized way. There’s a very good and natural flow between her body and the suit she is wearing (including the fabric parts, that I will mention in a moment). The sculpted parts of her suit/costume are incredibly well detailed, with a very “genuine” leather finish or appearance. It looks extremely convincing. She has strong facial characteristics which makes her look appealing and somehow authentic – as if she was sculpted by the looks of a real person. This is something I find very important, and it is something that the sculptors at Sideshow master incredibly well. When it comes to statues, it’s not only the eyes that are the windows to the soul, but in actuality, the entire face, and it’s just so darn important that a statue has a face that goes beyond the generic gender look. Unless, of course, the generic look is part of the vision, but that’s not the case here, obviously. The sexual theme is conveyed in very large extent by the suit of Black Canary – the fishnet leggins in particular. These actually make up for one part of the “mixed media” that is going on on this statue. You can tell that these are not simply sculpted on by studying the below photo closely. Here you can see how the fishnets are actually casting a shadow onto some parts of her skin. The other part of the statue that features mixed media is her leather jacket, which is described as a finely handcrafted leather jacket. Oh, and I believe that! It looks so convincing, and the costume fabrication department did an amazing job here. They’ve really elevated to a whole new level of quality and realism when it comes to the application of fabric, mixed media, parts. It’s really great! Overall, the sculpt seems to deliver on all parts. The sculpt is done by Pablo Viggiano and Dan Ulrich. The mold and cast is done by Daniel Staig. The costume is done by Dan Mahler and Tim Hanson. The prototype is painted by Jeff Camp and Kat Sapene. It’s natural for a pin-up styled statue to have a pose of a more “cover art” nature. That is to say that the pose doesn’t really have to make sense within the world of which the character exists. It’s not that I know Black Canary personally, so I wouldn’t be able to say whether or not she would actually put on this pose over the course of her crime-fighting day, but it does seem a little out of place. Again, pin-up style usually takes a character, and adds a specific, often playful, quality to the model. That’s what’s going on here, and I find it to work out quite well. It’s still within the established “norms” of this line of Batverse statues, and it is also consistent when paired with the art of Stanley Lau. I’m a firm believer in that a piece of art must be evaluated and understood within the context and vision that it was created, and I therefore find this to be a very well executed statue in terms of its design and pose. You might not like this type of pose, and maybe you would have preferred a more serious, maybe even dynamic action pose for this character, but that is clearly not the vision here, and it wouldn’t really make sense to judge this piece up against such a desire. Personally, I really like the pin-up style pose. It’s less serious, and comic today try so hard to be serious and all that. So to me, it’s relieving and even entertaining to see this side of these characters. Also, I like a good static pose when I see it – often more than I like a dynamic pose. So this pose sits well with me. Very simple. It’s a small added detail that will likely sit on the base. A wall section featuring a Wildcat Meta Brawl Fight Flier. Now, it’s a nice little added bit, but I would overall say that it is non-essential to this piece. So it’s not something I would consider a must-have. Unless you are just really in love with this statue, or this character – then I would of course understand if you should have a desire to own this also. But the main selling points are obviously the statue in and of itself. The base is also rather simple. It features a hexagonal shaped base with a brick/wall design. 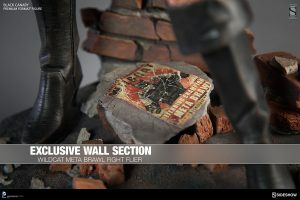 There are some broken off parts, or even debris parts, going on, on the surface of the base. 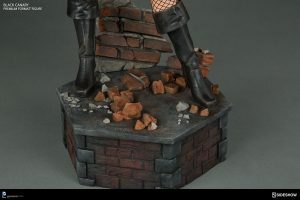 The fact that Black Canary is able to pull of this pose whilst having possibly just part-taken in a scuffle is amusing, and further adds to the light-hearted nature of this statue. But yea, the base is rather simple, and not exactly mind-blowing. This benefits the statue in that it doesn’t distract the viewer, since, clearly, the main attraction is the blond-haired fair lady standing on top of it. Right, so let’s wrap this one up! This is overall a relatively simple statue. It has details, but they are subtle. There are not that many bells and whistles with this piece (and character). Where this piece excels, however, is in terms of its expression and attitude. The magical ingredient is the appealing pose with its pin-up nature. You could argue that this is a good old case of substance over matter, but I at the same time don’t want to belittle the matter either. The sexual quality of this piece will clearly appeal to quite a substantial amount of collectors (Sideshow knows their audience). Hell, it even appeals to me! What can I say! I’m a sexually driven collector. That can’t come as a surprise to anyone!? However, the other important selling point about this statue is the harmonious interaction between sculpted sections and fabric parts. It’s an almost seamless exchange between the two. The body-suit seems so authentic, and it goes so well with the actual leather jacket. The fishnet leggings do wonders for the sculpted legs, and flow perfectly into the sculpted boots. This is a true testament to the wonders that lie within the realm of mixed media statues. It would have been very difficult to achieve the same level of authenticity with a fully sculpted statue. Also, from a mere craftsmanship point of view, this level of mixed media simply is that more impressing. Simple as that! Would I recommend this statue? Obviously, if you like this character, you should get this! I think this must most certainly be the pinnacle of statue renditions when it comes to Black Canary. No question about that. Personally, I’m not that big a fan of this particular character – but that’s simply due to the fact that I have read much about/with her. I have of course seen the TV series on CW where the character is portrayed, but I honestly don’t like that character at all. I much prefer the comics when it comes to that. I still feel that this is a well-rounded statue that is based on a clear vision or idea, and executed on a very high level. With that in mind, I don’t see why one wouldn’t get this piece. Well, maybe because of the price. But that’s a totally different story, but I do agree that prices are getting a bit too high. Especially when you factor in shipping and customs, if you live in particular parts of the world. I might talk more about prices in a future article – I don’t feel that this discussion belongs in this review, since it’s not an unusual price point by today’s standards. Overall, this is an extremely well-crafted statue. It is a testament to good craftsmanship, basically. It is based on a solid vision, in my opinion – simple, yet very appealing and interesting. I think that’s s wrap! Thanks a lot for reading. If you made it this far, you rock. ‘Battle of the Bastards’ was AWESOME! Just wondering if you were able to get both of her heels to touch the base? I’m having some trouble, and not sure if one is supposed to be a little raise up or not. I hate trying to wiggle or jam these statues down into the base. I don’t actually own this piece myself. So I haven’t had first-hand experience with this. How much of a gap are you having? Is it noticeable?